Summary: This was another lacklustre update from the software micro-cap. It was disappointing in particular to see revenue continuing to stagnate and — despite various cost-cutting measures of the past — operating profit dropping lower. Thankfully EDP has put itself up for sale and I am very hopeful a generous trade buyer can be found to conclude what has been a somewhat frustrating investment. In the meantime, there is the prospect of a 6%-plus yield to collect. I continue to hold. This was another lacklustre statement. December’s annual results had already confirmed revenue running at a 30-year nadir, and these interim figures showed the top line slipping a fraction to £2,505k. I can only presume this figure is a fresh H1 low. Still, the strong point of EDP’s business remains its recurring income. Annual software licences and hosting fees stayed high at 81% of revenue (or £2,029k), versus 80% last year (or £2,015k). EDP claimed its adjusted operating profit increased by 19% to £240k during the half. However, adjusting only for exceptional property costs and redundancies, my verdict was that H1 operating profit had dropped 13% to £188k. The profit shortfall was especially disappointing given EDP’s results for the last year or two have regularly cited the prospect of various cost-cutting measures. The sole saving still on the cards concerns annual expenditure of £35k on a £1.2m surplus property in Milton Keynes. All that said, I did mention in December that EDP’s pension accounting may understate the group’s reported profit. EDP pays nothing into its pension scheme, yet last year the accounting cost was £77k. During this first half, the pension cost was £41k — which is significant when my version of adjusted profit was £188k. EDP’s H1 cash flow absorbed £190k — due mostly to working-capital movements — to leave the firm’s bank balance at £5,357k. Other balance-sheet highlights included the aforementioned surplus property at £1,181k and upfront customer payments of £1,961k. Adding the cash and property together and then subtracting the upfront payments, I calculate surplus cash and property to be £4,577k, or 36p per share. Sadly these results have prompted me to downgrade my future operating profit guess yet again. 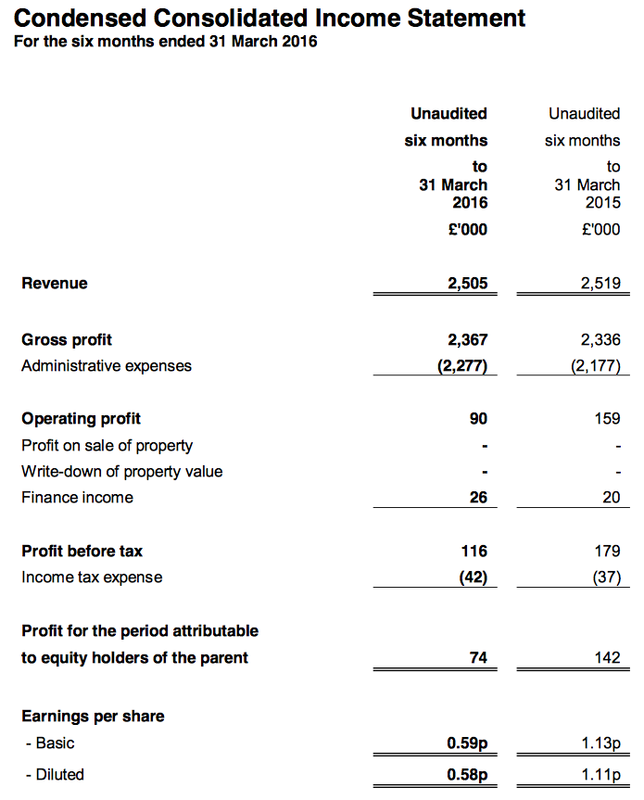 I was previously looking at £513k, but now I am going for £461k based on my calculation of EDP’s adjusted profit for the last twelve months, as well as the prospective £35k property saving. Applying a standard 20% tax rate would then produce earnings of 2.92p per share — which is well below the 5p per share dividend paid last year. A maintained 2p per share interim payout in these results suggests another 5p dividend is scheduled for 2016. Though EDP’s earnings may be understated by its pension accounting, it does seem that another 5p per share dividend will have to be part-funded by the aforementioned cash pile. Anyway, stripping out the 36p per share of surplus cash and property from the 73p bid price, EDP’s enterprise value (EV) comes to 37p per share. The P/E using my EV and earnings calculations is therefore 37p/2.92p = 12.6. I would be quite frustrated with these results were it not for EDP announcing a “strategic review” in April. The announcement was the best news I had heard from EDP since I first bought the shares in 2012. It seems to me that the trio of North American value funds, which in aggregate control 28.5% of EDP, have finally agitated for action. Stock-exchange rules have since prompted certain other EDP shareholders to disclose their positions, including fellow software firm Sanderson (SND) with a 2.3% stake. I’d like to think all of these shareholders will be keen for a sale, too. All told, I am hopeful that EDP can sell itself for a nice cash bid in the not-too-distant future. While the current share price does not appear to be an obvious bargain on present earnings, it is worth noting that a trade buyer could eliminate much of EDP’s annual £400k director wage-bill. Costs associated with being a listed firm would also disappear. I reckon such savings alone could double the group’s level of profit. Disclosure: Maynard owns shares in Electronic Data Processing. This entry was posted in Electronic Data Processing, My Shares and tagged EDP, Electronic Data Processing on June 6, 2016 by Maynard Paton. I am curious why you still hold this one. As of 2012 the share price was about 50p and net assets with 58.2p (which was understated). Today the share price is 70p and net assets are only 37p but the business is dying. I guess the question I would ask you, if you didn’t hold these shares already, would you be buying today? The smaller asset base is due to EDP having sold its surplus freehold properties. I would not have said the asset base was understated back in 2012 as the freeholds sold were disposed at or slightly below book. The share price return has been enhanced by some chunky dividends in the last few years. I am holding on as there is now a potential bid situation with dissident investors keen to sell out (I hope) via EDP’s strategic review. The business has a very disappointing track record and I would not buy it now. I bought a few years ago as a deep value situation and it has worked out alright so far. 10,000 at 71p and 6,000 at 73p. I wonder if these directors know something is happening with EDP’s Strategic Review. Sanderson is a small software business so I would expect its directors to have more insight than us ordinary punters.